Oil stocks rallied as OPEC began making good on its pledge to cut production. Leading the rally were service companies Noble Corp., Weatherford International, Overseas Shipping, Ensco, and Newpark Resources. 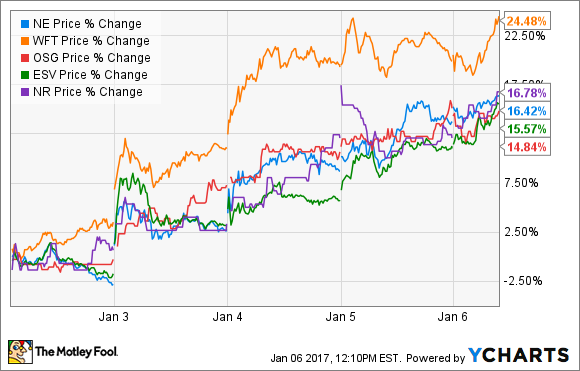 Offshore driller Ensco was the only company on that list that had any notable individual catalysts helping fuel its rise this week. The first was the release of the final results for its senior notes exchange offer, which saw the company accept $650 million in principal value of legacy notes. In addition to that, Ensco's management team presented at an industry conference this week and detailed their outlook for the offshore market. Not only do they expect spending to bottom out this year, but they see several catalysts for long-term growth. That rather optimistic outlook drove several offshore drillers higher this week, including Noble. Aside from that, the continued rally in crude oil was the primary catalyst behind most of this week's biggest movers. In Weatherford's case, investors are betting that rising oil prices will finally drive a turnaround in the oil-field services company's financial results, which have been under pressure for years due to problems with its balance sheet, issues with its accounting practices, and the oil market downturn. Likewise, investors are hoping for a similar turnaround in demand for drilling fluids supplied by Newpark Resources, which could reverse its two-year revenue slide. Finally, investors sent Overseas Shipping's stock up this week on the hopes that an improving oil market will drive demand for tankers. The company, which recently spun off its international arm, is now entirely focused on the U.S. Jones Act market, which should grow as more American refineries take advantage of domestic production from shale plays. Investors see the OPEC-induced improvement in oil prices driving a recovery in shale production, which could fuel incremental upside at Overseas Shipping as refineries accept more oil from these sources. The oil market is entering 2017 on an optimistic note as OPEC starts shutting down some of its pumps. Those efforts should begin to drain the market's oversupply, which will allow other producers to start working on bringing future supplies online. That should flow down to an increased workload for service companies, which could see an end to their recent revenue slides.